Hi friends! 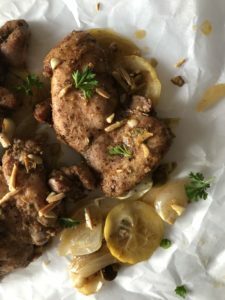 Today, I am sharing with you a delicious chicken dinner dish that I made over the weekend that was a hit for hubby and me. 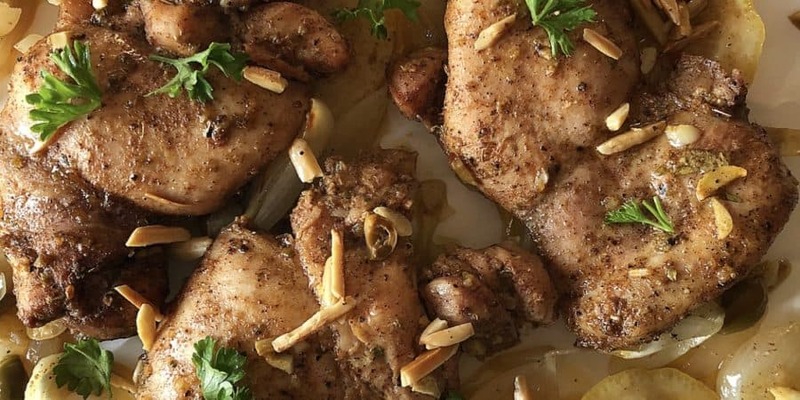 I never ate chicken thighs growing up; we were accustomed to eating chicken breast and never darker meat but I must say chicken thighs really take on flavor well and remain juicy. The addition of olives and lemons is what really makes it feel Mediterannean. I hope you make this dish for your weeknight dinner and enjoy it with your loved ones! Preheat oven to 400 F. Line a baking sheet with parchment paper and place aside. In a bowl, mix together the olive oil, garlic, oregano, allspice, paprika, and one lemon’s juice to make a marinade. In a large ziplock bag, add the cleaned and trimmed chicken thighs and pour the marinade all over it. Marinade for an hour. Place the sliced onions on the baking pan, then add the sliced lemon. Take out the marinated chicken to place on the pan as well. Pour the marinade all over the chicken and onions very well. Then season some more with salt, pepper, oregano, allspice, paprika, garlic and onion powder. Bake in the oven for 15 minutes then take out and add the olives. Place back for remaining 10-15 min till done cooking. Take out and enjoy with some rice or as is! Garnish with parsley and toasted slivered almonds.